The Regis School focuses on preparing students as the next generation of leaders. Many opportunities are provided to strengthen character and develop skills based on mutual respect and cooperation. Lessons in leadership begin early in the classroom or on the playing field through group interaction. Students learn a spirit of collaboration, acceptance, and community through teamwork and partnership. As students mature and demonstrate the leadership skills representative of Regis, more responsibilities are shared. 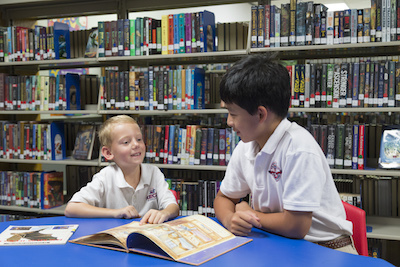 The Regis Experience promotes an atmosphere for boys to become scholars and gentleman in the Sacred Heart tradition. The Student Council consists of a group of Middle School students who serve the Regis community by organizing and supporting service projects, cultivating community spirit through fun activities, and providing an avenue for students to voice their opinions in a responsible way. The Social Awareness Ambassador serves as a liaison between the student body and the Social Awareness Committee. The Ambassador communicates student ideas and feedback to the committee and raises awareness within the student body for upcoming service projects and activities. Sacred Heart Goal III drives this leadership position. Class representatives serve as liaisons between the Student Council and their homerooms. They voice the students' concerns and report the discussion in the council meetings to the students. Representatives plan and work to accomplish the Council’s goals. The treasured “Big Brother, Little Brother” relationship fosters leadership skills among Regis’ middle school students. The older boys take responsibility for younger boys at many school functions. Big Brothers lead by example, serving as mentors and modeling expectations of respect and high moral character. Strong bonds between big and little brothers are formed as the relationships build over a four year period. Students in 3 Pre-K are introduced to their fifth grade big brothers and remain with them throughout the next four years. Student Ambassadors serve the Regis community by filling leadership roles at various events. For example, students participating in the program provide tours to visiting families during open house functions. They also act as buddies for on-campus visitors who come to spend a day as a Regis student. In addition, these boys act as greeters and hosts for our special guests during many on-campus gatherings. To serve as an ambassador, a student must be in good academic standing and be recommended by a teacher to represent Regis. The Berchmans’ Brothers Altar Boy Society helps Regis boys grow in their faith, in their sanctification, and to build community around the Most Sacred Heart of Jesus. Students participate in trainings and develop their spiritual life as they assist the priests throughout the year in Regis liturgies. All middle school boys are welcome to join this program which is led by the middle school religion faculty. Each day, Regis students gather in the Student Life Center for morning prayers and announcements. Throughout the year, eighth grade students take turns leading these daily gatherings. This privilege of facilitating fellowship is anticipated as the boys move into eighth grade and is a significant opportunity for them to grow as leaders of the school.